"After installing iOS 11 onto my iPhone 6S I go to input my passcode and the iOS 11 touch screen does not work. I hard reset my 6S more than 15 times. One of those times I got the touch screen to work. I was able to unlock the phone in. I had to reboot for some reason and the issue is back. I did not have this issue with my phone AT ALL before iOS 11 today. Does anyone have a solution for this issue?" It is well known that Apple has brought lots of new features in iOS 11, thus, more and more users choose to buy a new iPhone or upgrade their old iPhone to iOS 11. However, sometimes accidents come unexpectedly. Some users on Apple discussion community complains that iPhone screen not responding to touch after updating to iOS 11, also the newest iOS 12. What to do when iPhone screen unresponsive to touch after iOS 12/11 update? You will get the top 8 tips and tricks in this tutorial to fix screen not working on iPhone XR/XS/X/8/7/6s/6/5s/5 or iPad/iPod touch. Owing to iPhone or iPad touch screen is liable to not responsive due to dirt or moisture, be sure that your fingers are clean and dry while using touch screen. Moreover, always prepare to keep the device screen clean. 1. Unplug the device and shut it down. 2. Wipe off fingerprints with a microfiber cloth. 3. Restrain the cloth and remove sticky substances. Some gloves work with touchscreen, while others don't work at all. Therefore, if you are accustomed to wearing gloves in the outside, especially in winter, attempt to not wear gloves while touching your iPhone or iPad screen. And then check out if the touch screen is normal to use. You have to try this for this method is suggested by Apple. In some countries around the world, users are tended to add phone case or screen protector in order to stop smash or away from dirt, however, the case or screen protector may prevent you from touching your screen successfully. So except for cleaning your hands and screen, you could try to remove the screen protector if it has. Try to fix iOS 11/iOS 12 touch screen not responding by checking 3D touch sensitivity. Go to Settings > General > Accessibility > 3D Touch and then adjust the sensitivity slider from light, medium to firm. Then check out if the touch screen is properly functioning now. You could try to charge your iPhone/iPad with original Apple charger and cable. It is interesting that one of a user change the charge and cable to the original and finally the touch screen is responsive again. Thus, you can use this way to have a try and then successfully resolve the problem. Restart your device will turn off all the processors, including the processor that stop you from normally using your touch screen. So try to fix iOS 11/iOS 12 touch screen glitch by restarting and finally your touch screen may work again after a restart or force restart. 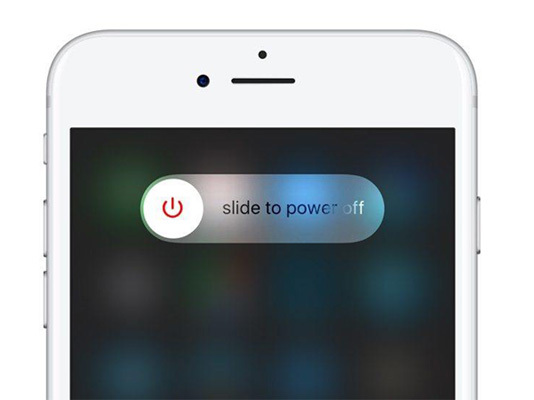 How to restart iPhone/iPad: Hold and press the top (or side) button until the slider appears, then drag the slider to power your device totally off. Finally, hold and press the button again to turn on the device. For iPhone 8 or later: Press and quickly release the Volume Up and Volume Down button. And then press and hold the Side button until you see the Apple logo. For iPhone 7/7 Plus: Press and hold both the Side and Volume Down buttons for at least 10 seconds, until you see the Apple logo. For iPhone 6s and earlier, iPad, or iPod touch: Press and hold both the Home and the Power/Sleep buttons for at least 10 seconds, until you see the Apple logo. 1, Click the trust this computer button on your iPhone or iPad. Then type your passcode to continue if it asks. Click on the phone logo on iTunes, then access your phone settings. 2, Tap on Summary and you will see Restore iPhone button on the right side. Click it and confirm the operation. 3, Wait for your Apple device to be restored in progress and test whether the touch screen is responsive or not. Although to restore iPhone is a suggestion, but you will lose all data in it. Fortunately, there is one workable measure to fix iOS 11/12 touch screen not working issue, that is to make use of Tenorshare ReiBoot software. First of all, you have to connect your device with a computer that has installed free Tenorshare ReiBoot, and then this software will recognize it. Click Enter Recovery Mode and Exit Recovery Mode to let your device touch screen get as normal as before. If that one-click steps couldn't solve your problem, upgrade to Tenorshare ReiBoot Pro and try to fix this stuck by repairing operating system. Click Fix All iOS Stuck > Fix Now and download the IPSW file to start repairing. After that, your device will automatically restart and go back to normal. Note: You could even use this application to downgrade from iOS 11 to iOS 10 without pc or downgrade from iOS 12 to iOS 11. The above-mentioned options enable you to fix touch screen unresponsive issue on Apple device. If you still encounter with iPhone, iPad or iPod touch screen issues, I suggest you to get in touch with Apple Genius Bar or Apple authorized service provider nearby.